HVAC stands for heating, ventilation and air conditioning. The size of ductwork for such systems depends on the size of the unit or system installation design as well as heating or cooling space considerations. Local building and residential code requirements also dictate sizing in various installation scenarios. HVAC ducting comes in many sizes and shapes. Ducting is the component of an HVAC system that carries the flow of air through a residence or building. Ductwork is composed of various components and materials, including galvanized steel, insulated and non-insulated steel tubing, flexible metal, fiber and flex ducting. Ductwork can be customized to meet any installation need and offers adaptors from one size to another as well as elbows, boots, collars and reducers or increasers. The duct size must adequately handle air flow intake and return in order for an HVAC system to operate at optimal levels. 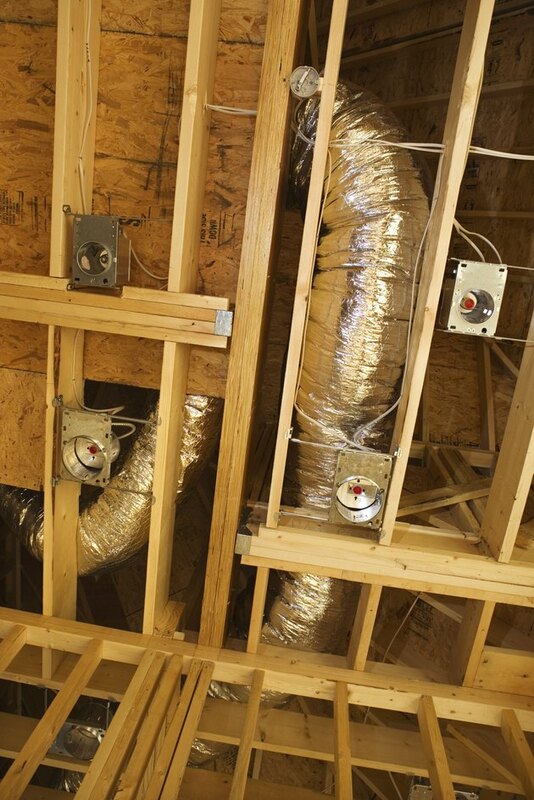 For this reason, homeowners may want to contact a certified HVAC technician or contractor to determine the optimal size of ductwork throughout the home or business environment that also measures up to code standards. Optimal airflow based on cubic feet per minute as well as velocity of air provided by other components of the HVAC system determine the correct ductwork sizing for each scenario. Rectangular or square ducting comes in standard sizes ranging from 3-by-7 inches to 35-by-40 inches. Sizing is based on airflow needs per cubic foot per minute, as well as velocity. The HVAC model that you're interested in should offer information regarding the maximum airflow per cubic foot per minute, or CFM, to help you determine adequate duct sizes. The type of ducting you use, such as flex ducting or rigid ducting, also determines the velocity of supply and return air. Airflow is also affected by the length of straight portions of ductwork, as well as the number of trunks or branches in your overall duct design. Round ducting comes in standard sizes ranging from 4.9 inches in diameter to just over 41 inches in diameter, with sizing also depending on airflow needs per cubic foot per minute and velocity. Size of your ductwork may also be affected by the design and construction of your home or business as well as the need to reduce the size of ducts coming from each vent or register in the system in order to provide constant air velocity and air pressure throughout the system and into different rooms.